One of the many goals that my sister and I have in cooking, baking, and creating recipes is to find ways to make these culinary endeavors as simple and accessible as possible. While we do love our interesting, oft-not-heard-of ingredients and contemporary preparation methods, there is only so much time in the week. We love ingredients that are multitaskers; whole foods that are transformative and can be used creatively throughout the week. While food preparation and experimentation may be our greatest hobby, it doesn’t quite pay the bills just yet! In this recipe we have made more than necessary for just one meal. The polenta and tomato sauce both keep quite well in the fridge and are actually best a few days after initial preparation. Â Simplicity of technique and ingredients surpasses expectations in these two recipes. 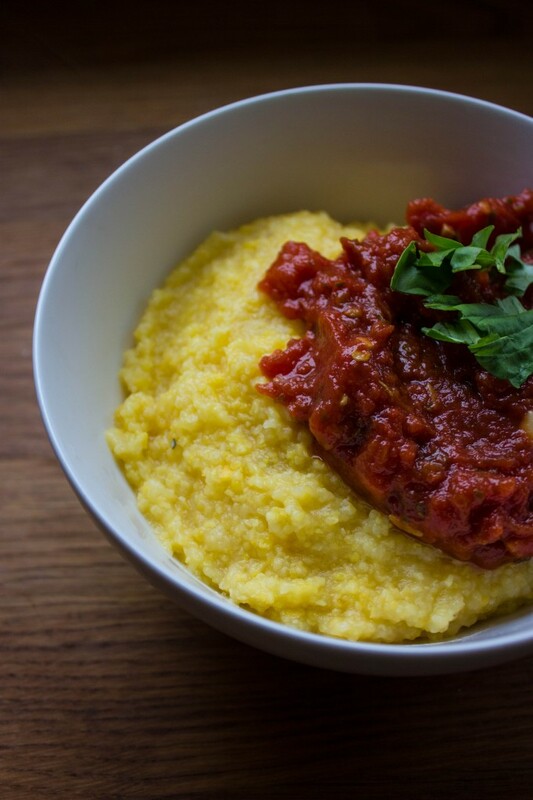 Polenta, substantial and filling, pairs wonderfully with both the tomato sauce of this recipe, as well as the eggplant tomato sauce of the following post. 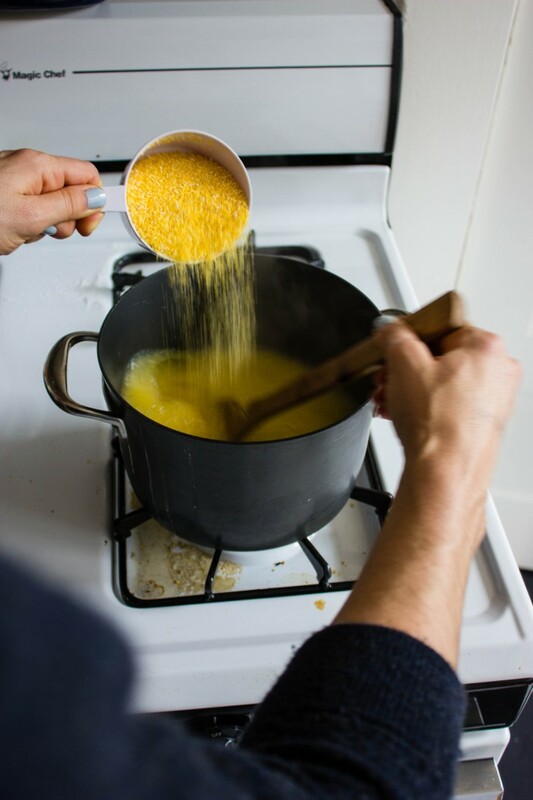 Our beloved shape-shifting polenta is one of those hard-working multitaskers, and is used in serious rotation in our house. Think back to chemistry class when certain elements took different forms at different temperatures. Polenta does this splendidly and is a savior in the face of redundant, monotonous leftovers . 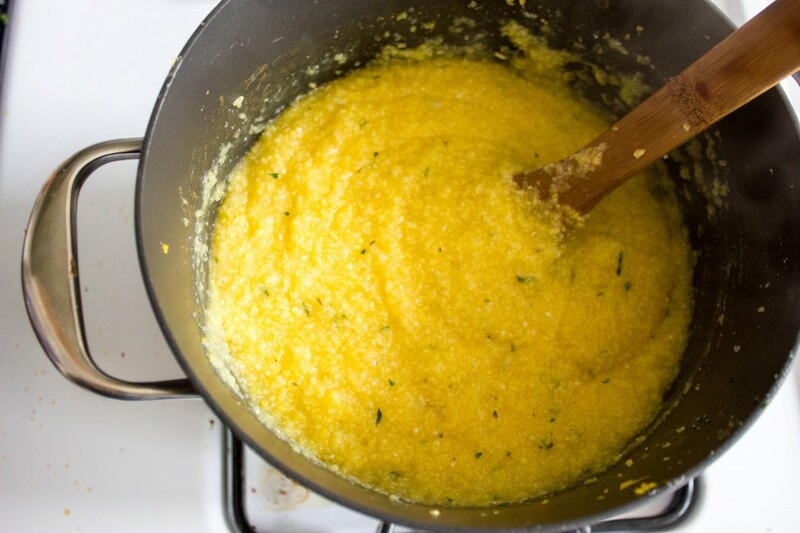 We will make the basic creamy recipe here, but tripled in ratio so as to put about 2/3 aside for the next up-coming recipe, polenta fries. 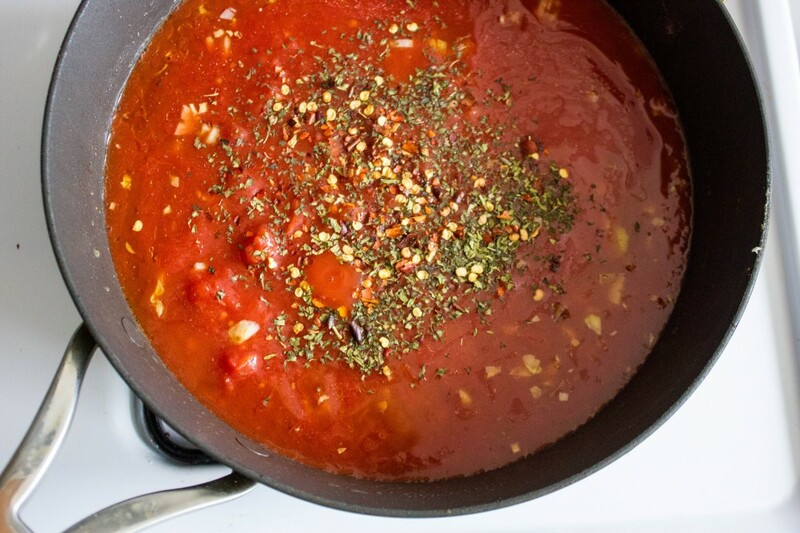 Our tomato sauce is equally as transformative in these recipes. 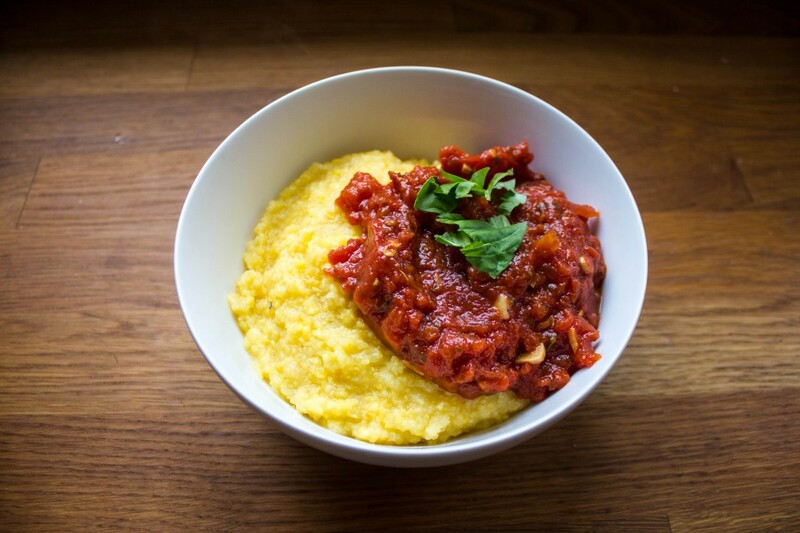 We ask that you double the recipe, reserving half for an eggplant tomato sauce to serve with the polenta fries the next day. 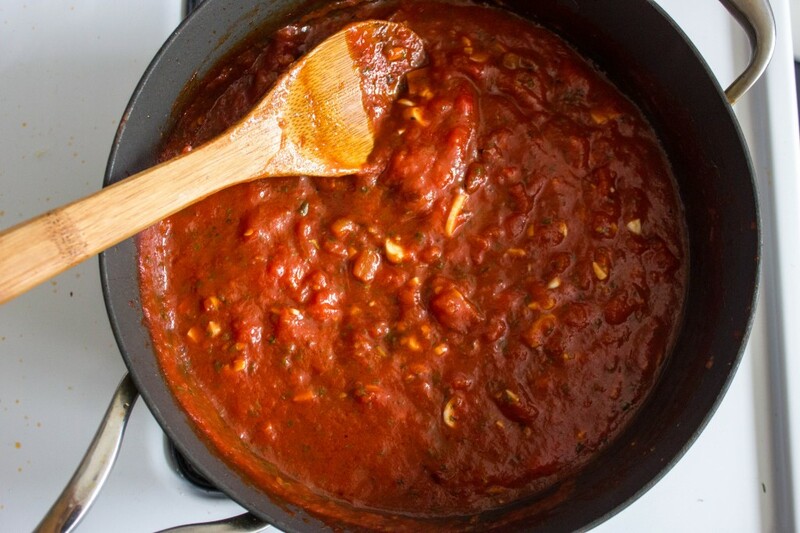 The key to the tomato sauce is using San Marzano tomatoes. We used the canned kind here as (gasp) they are not in season now. If you don’t yet know about the most glorious antioxidant lycopene, found in high levels in our dear tomatoes, here is your chance. The phytonutrient lycopene gives tomatoes their red hue. Â When consumed, it has been shown to lower the risk of heart disease and certain types of cancer. For optimal nutrient absorption, cook your tomatoes and pair with olive oil or other plant-based fats. Looks like we’ve got you covered on both fronts in these two recipes! As the sauce cooks down, it’s color and flavor concentrates. And when the extra sauce is keeping in the fridge for the following night’s dinner, the flavors meld further. Bring the water to a boil, then pour the grits into the water, meanwhile whisking the water to break up any clumps. Lower the heat to a low simmer and stir for a minute until it starts to thicken. Toss in the herbs and put a lid on and come back every 5 minutes to give it a good stir. It may look ready at the 10 or 15 minute mark, but keep cooking as the grittiness will soften and smooth out. Cook this way until 30 minutes has passed. Then, salt to taste and serve. 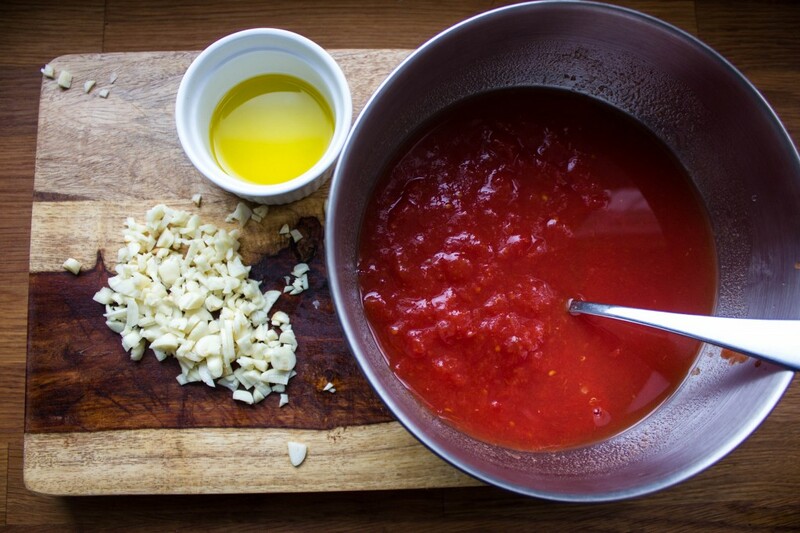 Open the can of tomatoes into a bowl and add one cup of water to the tomatoes. With your hand, mix the water in and crush the tomatoes. In a large saucepan (not a deep pot) over medium heat, add the oil. When the oil is hot, add the garlic and saute but don’t brown. When the garlic looks like it is cooked, add the tomatoes and juices, red peppers, salt and oregano and allow to simmer for 20 minutes. The longer, the more intense and rich the flavor. Right before you are done cooking, add the basil leaves, stir and allow them to wilt. Serve to your liking with a sprinkling of herbs. Reserve about 2/3 of the polenta and half of the tomato sauce separately in your refrigerator to use for the part 2 recipe. This is a delicious as it looks. I made it for my kids and they loved it. My son-in-law is Australian and doesn’t like mushrooms, so I cooked them seperately and added them on the top of the sauce.